Back in the summer of 1995, at the tender age of 10, I sat shotgun in my father's TVR Griffith, headed to the traditional establishment that all respectable Brits frequent every Sunday: The pub. The twisting country road, meandering high up in the rolling hills of the Pennines, possessed a wonderful sweeping S-bend. My father and I aptly nicknamed the curves "Eau Rouge." And just a mile or so past this heavenly sweeper was a rustic English brewery - imaginatively called the "Fox and Hounds." And it was powering through "Eau Rouge" in a 2,300-lb sports car, listening to the 5.0-liter V8 roar like a possessed T-Rex, where the magic of the automobile settled deep inside my soul. Ever since I was two, long before tasting the splendidly-salty Fish n' Chips at the Fox and Hounds, I was a car baby. According to my mother, I could name every make and model of vehicle on the road, even though I still called a banana, a "neenana." But it wasn't until I was ten that I truly became infected with the "gearhead" disease. A disease we all know to be terminal. There is something about a convertible two-seater sports car, with the viscous, yet intoxicating personality of a TVR, that etches itself into your memory more vividly than your first kiss. And it's just as contagious, too. Once you experience a launch to 60 from a stop light in 4.1 seconds — aboard a fiberglass missile — a car will never simply be a means of transport again. The TVR Griffith was, and probably still is, as close to a racecar as any production vehicle I have driven. It didn't have power steering, gifting the driver with a raw connection to the road unheard of in today's machines. The five-speed manual meshed to a clutch made of pure lead, and the suspension was bone-snappingly stiff. This made the ride intolerable, and the noise emitted from the twin exhaust was preposterously loud. But the car was alive. The V8 was its thumping heart, and its infectious soul was its dangerously snappy handling. Sure, the leather smelt like it was still attached to the cow in which it came, and a colander would have offered better shelter from the elements than its flimsy fabric roof. Yes, it broke down more than an iconic 80's Jaguar, and every turn encountered risked death by vehicle savagery. But despite all this, I still adore that Griffith. After all, you never forget your first love. As a car manufacturer, TVR was as brilliantly British as a hot-cross bun. Founded by Trevor Wilkinson, back in 1947, and based outside of Blackpool, England (think Paris, only for peasants and unwashed transsexual hookers). In 1981, Wilkinson sold the company to avid TVR enthusiast Peter Wheeler, who would hang onto TVR for 23 years — moving from the Triumph and Ford engines of old, to the meticulous Rover V8. The cars designed and produced under Wheeler's command were indisputably stunning, built with an incredible surfeit of performance. TVR's did, however, have a reputation of being woefully unreliable and scary to drive at speed, causing many a journalist to divulge in substandard remarks. I, conversely, never wanted them to solve these issues. It's what made a TVR a TVR. The interior buttons were all identical and unmarked, meaning you had no idea whatsoever (even after years of ownership) how to accomplish simple tasks such as opening the trunk, or activating the headlights. The indicator lights on the TVR Chimaera had a couple of odd-looking grooves surrounding them, rumored to be where Wheeler's dog took a bite out of the foam design model. And, after careful inspection from Peter Wheeler, he deemed the hound-bitten facade actually looked better. So he left it. Cars don't get designed like this anymore. 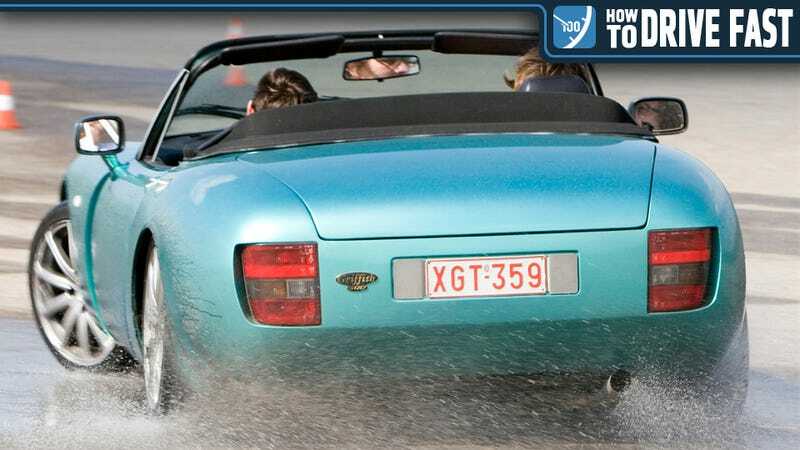 A TVR was unmistakable and inimitable. They were a driver's machine that left you emotional and, like the car, undeniably alive. And that is why the demise of TVR is one of the saddest losses the British auto industry has felt in recent years. On July 12, 2012, Nikolay Smolensky, a Russian banker who purchased TVR back in 2004, confirmed a permanent end to TVR car production. For a company undergoing massive financial difficulties for years, this came as no surprise. But now, we are merely left with memories of the wonders that came out of Blackpool, back in its heyday. I can remember that afternoon in 1995 like it was yesterday. I could barely see over the dash, as I gracefully slid across the hopelessly unsupportive, cream leather seats. The metallic British Racing Green paint glistened in the sun. The excitement built as we came ever closer to "Eau Rouge." And as we crested the mound and saw our treasured bend in the distance, we held our breath, and floored it. 120, 130, 135. BRAKE!!! Now POWERRRRR, through, up and over the ridge, our stomachs threatening to burst out of our throats.